How do I know what T-SQL query statement is currently running on my SQL Server instance? How to find the T-SQL Query statement being executed from a batch? The perplexing question here is that a batch or a stored procedure may have multiple statements – but, getting to the exact statement that is being executed at a given point needs a bit of manipulation. Basically, the sys.dm_exec_requests DMV returns us information about each request that is currently being executed by SQL Server . The sys.dm_exec_sql_text() returns the text of the SQL batch that is identified by the specified sql_handle. The statement_start_offset represents the number of bytes within the SQL batch indicated by the sql_handle at which the currently executing SQL Statement starts. Similarly, the statement_end_offset returns the number of bytes within the SQL batch where the currently executing SQL statement ends. Using these 2 values in a simple SUBSTRING function will return us the exact SQL Statement that is being executed by SQL Sever. If you have a similar query that you use, please share it in the comments area below. 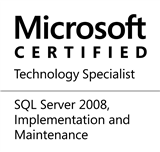 This entry was posted in #SQLServer and tagged #SQLServer on September 21, 2015 by nakulvachhrajani.